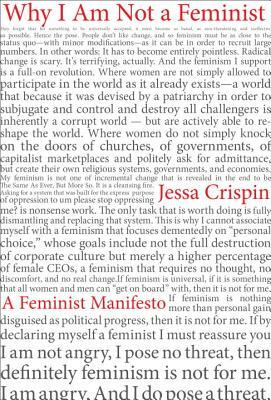 Crispin delivers a blistering rebuke to contemporary feminism. She lays down the gauntlet to those who wear t-shirts with catchy sayings and talk about being empowered, but who reject those who actively upend the comfortable status quo. The feminism she embraces is gritty, provocative, threatening, uncomfortable, unsafe, and difficult. With an excellent grasp of first- and second- generation feminists and feminist actions, she shows that they dared to work toward reshaping the entire patriarchal culture. "Finding new modes of existing means rejecting the rewards we've been promised for playing along." Read this manifesto. Challenge your thinking. Mind=blown.